Fermented sausage (aka salami, saucisson) cultures from Chr. Hansen offer a wide range of options for creating classic cured meat products like chorizo, saucisson, peperone, kabanos, garlic sausage and salami Milanese. 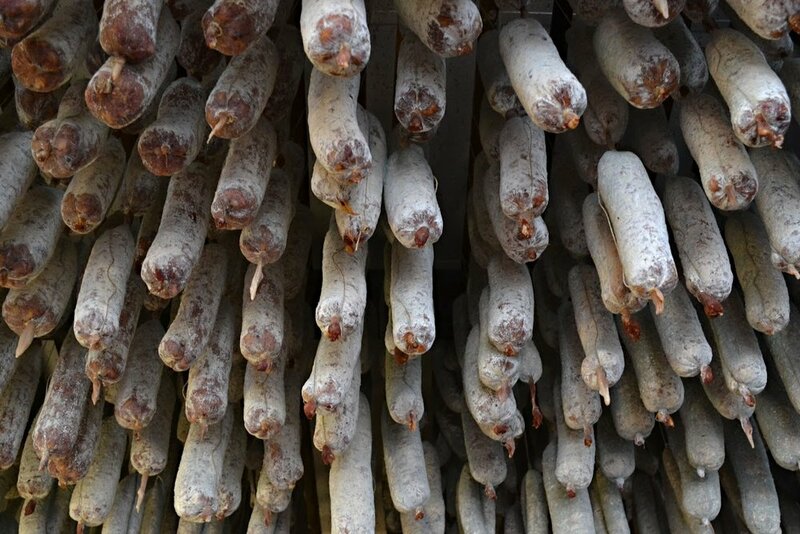 Uncooked fermented sausages such as Italy's salame, Spain's chorizo, Germany's bierwurst and France's saucisson sec, all originate from the ancient art of salting, curing, fermenting and drying meat to create a long-lasting, stable product. Today, much of the past's guesswork and dangers are gone, with beneficial inoculated cultures produced under hygienic conditions able to give excellent stability, flavour and colour to every batch. e.g. German Bierwurst, Westphalian Salami, Danish Salami, etc. For this style of sausage, the minced meat typically has no added nitrate. Fermentation takes place between 22-26°C to a pH of around 4.5-4.8 and is relatively fast (around 30 hours). The salamis are typically smoked when the water activity is above 0.90 (semidry). Production time is less than 3 weeks. Contains both Lactobacillus sakei and Staphylococcus carnosus bacteria to give a distinctly 'German' flavour with good acidification and a clear lactic acid taste. The Lactobacillus sakei gives good growth potential and is able to suppress indigenous bacteria, while the Staphylococcus carnosus gives good colour and a mild aroma. Performs in a similar way to T-SC-150, but results in a faster pH-drop (and thus a more 'tangy' finished flavour) by using a different amount and treatment of the applied Lactobacillus sakei bacteria. A single strain culture (Staphylococcus carnosus) recommended in all sausage products where extra flavour or nitrate reductase activity is required. S-B-61 helps achieve good colour formation and stability while bringing additional flavour development. A multi-culture product providing additional bio-protection against Listeria monocytogenes (an increasing contamination problem in salumi production). The culture works at a wide temperature range and is suitable for both short and traditional fermentation styles. Acidification depends on fermentation temp and typical usage gives a controlled, moderate pH-drop with mild acid formation, good colour stability and a rounded but mild flavour enhancement. A fast-growing creamy white mould of wild flora with a distinctive fresh mushroom flavour. Mold 600 is great for traditional salami styles dried at lower temperature and/or low humidity. The mould helps prevent excess surface drying and loss of lactic acid during maturation that can increase pH and result in less acidity/tangy flavours. By inoculating fermented sausages with a standardised mould culture, you can help protect them from undesirable mycotoxin moulds, yeasts and bacteria contamination. e.g. Spanish Chorizo, Soppressata, Salami Milano, French Saucisson, etc. These sausages typically have nitrate or nitrite/nitrate added, with fermentation between 18-24°C and pH kept above 5.0 over 40 hours (medium / traditional fermentation). Production usually last three weeks and the finished salamis are typically covered with mould. Water activity is below 0.90 (dry). Recommended for semi-dry cured salumi (moulded or smoked) where a fairly slow fermentation, mild acidification and an aromatic profile is preferred. Gives a controlled and moderate pH-drop to produce a mild lactic acid taste with good colour formation and stability. Use to achieve a mild, rounded flavour typical of southern European salami types. Combines the best of several different bacteria strains to produce stable salamis with a pronounced 'Mediterranean' flavour. SM-194 offers good growth potential and the ability to suppress indigenous bacteria. Pediococcus pentosaceus gives a mild lactic taste and accelerated pH-drop at higher temperatures, while two different Staphylococci give more intense colour and mild aroma development. The following products contain both starter and mould cultures, specially formulated for traditional and fast-fermented salami types. Perfect for traditionally fermented sausages with short production, giving a strong and stable colour with an aromatic flavour. Added yeast gives extra flavour development. Gives quick and controlled acidification and a typical 'Mediterranean' salami character with a good aromatic profile. Gives the distinctly smooth and gentle flavour of Italian salami but with fast acidification for added safety and stability. A combined culture providing fast acidification and an attractive 'Southern European' flavour profile, as well as control against Listeria monocytogenes contamination. e.g. American pepperoni, Summer sausage, Lebanon Bologna, etc. For these sausages, typically no nitrate is added to the meat and fermentation occurs above 32°C for less than 15 hours (very fast) to a pH below 4.8. Production is usually around 2 to 3 weeks, with water activity above 0.90 (semidry) . Finished products are typically cooked and smoked, often right after fermentation. An extra fast culture perfect for making pepperoni type sausages. It contains both Pediococcus pentosaceus and Pediococcus acidilactici bacteria and has been specifically formulated for fermentation temperatures between 26 and 38°C. Use when a pronounced tangy/acidified flavour profile is required.